Do you miss charging your iPhone? Then we have a solution for you. 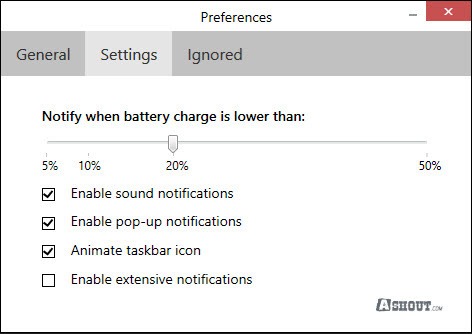 iBetterCharge, a small software for your windows and Mac operating system lets alerts you when your iPhone Battery is low. If you frequently miss charging your iPhone, and if you use your computer a lot, then you should try this application. With our busy schedule we may often forget to charge our iPhone. When we try to use our iPhone to make a call, text or just to play games, that time we will notice that we forgot to charge our iPhone. From now onwards you don’t need to remember to charge your iPhone. Because iBetterCharge will alerts when your iPhone battery is low. iBetterCharge is a small software for both Windows and Mac operating system to alert charging our iPhone. By this way we can stop thinking when to charge, looking iPhone battery status again and again to check the battery status. This little software will do that work for you. This is very simple tool and easy to understand the interface. Once you run the application, it will show a small mobile icon on your taskbar. That indicates iBetterCharge application is running on your system. To view the status of your iPhone charge on your PC, just click on that icon, and it will shows you an iPhone name (P.K.Arun on iPhone) and it’s battery status (73%) of that device at top of this menu. To change settings of the application, select Preferences option. Once you select Preferences, you will see Preferences window. In General tab, you can enable this application to start on windows boot by putting check mark on “Lauch iBetterChargeWin on startup” option. By this way, your computer automatically tracks battery status of your iPhone on windows startup. So you don’t need to launch this application again and again when you start your windows. In Settings tab, you can set when you need get alert to charge your iPhone battery. Currently we can get alerts only when your iPhone battery reaches 5%, 10% 20% and 50%. Here you can also set what are all the different types of notification you need to get when your iPhone battery reaches that particular percent. You can enable or disable sound notifications, pop-up notifications, animate taskbar icons or enable extensive notifications option here in settings tab. In Ignored tab, you will find a list of iDevices or iPhones which is currently using the same Wi-Fi network. Here you can disable the devices which you don’t need to get battery alert notification. iBetterCharge uses Wifi connection to give iPhone battery status alert on your computer. To get alerts, we need to use our Computer and iPhone on the same Wi-Fi network, and both should be connected to the Wifi network of course. Also, you need to enable “Sync with this iPhone over Wi-Fi” option on your iTunes to works this software. 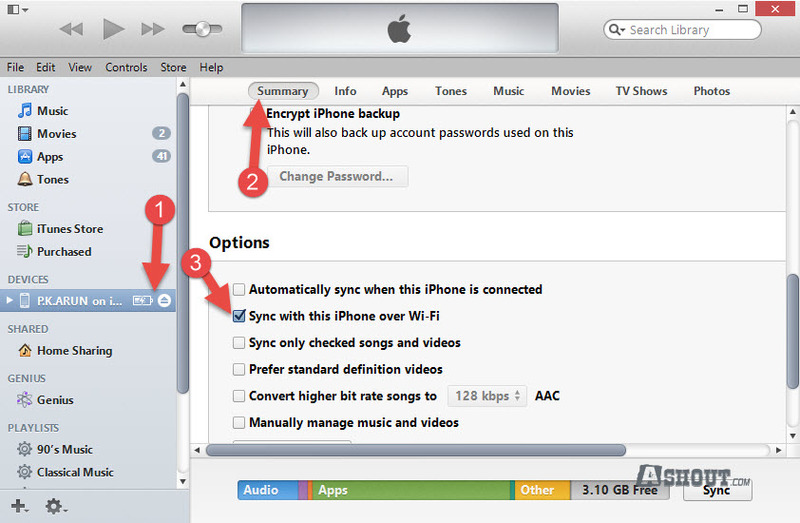 To work iBetterCharge software, we need to enable “Sync with this iPhone over Wi-Fi” option on our iTunes. If you don’t know to enable this option, then follow below steps. 1. Connect your iPhone to your Computer with connecting cable. 2. Open your iTunes, and select the iPhone and click on the summary tab. And under Options, put check mark for Sync with this iPhone over Wi-Fi. That’s it. Now we enabled our iPhone to Sync over Wi-Fi network. To verify, remove the connected cable from your iPhone and Computer. Now restart your iTunes. Now you will see your iPhone on your iTunes under the Devices without connecting your iPhone with cable. How to Setup iBetterCharge on your Computer? 3. 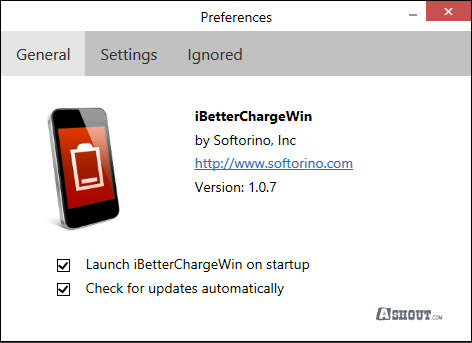 Now open iBetterCharge application by double clicking on that icon, which is available on your desktop. 4. Make sure you enabled Wi-Fi connection on both PC and iPhone. 5. Configur iBetterCharge according to your requirements. That’s it. Once you done all the above steps, your iBetterCharge software will alert automatically when your iPhone battery is low. By this way you will never forget to charge your iPhone. iBetterCharge software can be a good choice for those who use computer and iPhone on Wi-Fi network, and those who often forget to charge iPhone with their busy schedule. This is really a handy tool to get alerts when your iPhone run out of battery. By this application we not only get alerts, but we can also see the iPhone battery status right on our computer without touching iPhone. So this a right application for those who bother about iPhone battery status.